The exersaucer is a hot commodity in this house, be it baby or toddler! It was one of Cassia's favourites and it is quickly becoming one of Miss Anjali's. She can spend more than half an hour at a time in it (baby speak for a lifetime, I can do so much in that time) She has to fight her toddler sister for it though as sometimes I still find Cassia in it! 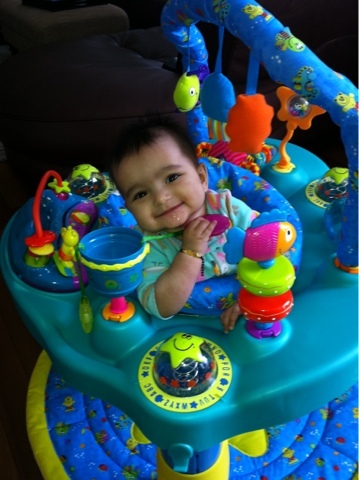 Love the exersaucer... and also love that it was a gently used hand me down from some family! Free and fun- what more could we ask for!